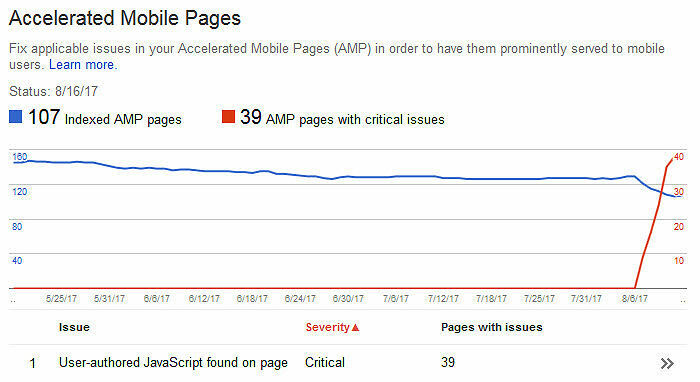 If you’ve noticed your WordPress website AMP Pages are showing critical errors in Google Webmaster Tools don’t worry. The AMP errors were caused by Automattic’s Amp plugin after a recent upgrade, that’s since been fixed. These errors were caused by WordPress AMP plugin not removing script commands, and and have been fixed. Apparently after it’s previous update the amp plugin was not stripping out <script> and </script> commands in the html code. That’s a big no-no to Google. Automattic updated it’s amp plugin that cured this problem. We are posting this for reference in case some are still having the problem. To fix this on your WordPress website log into your admin panel and click on updates. WordPress should prompt you to update the amp plugin. Or you can download it here from the wp plugin repository. Use this Google AMP testing tool to verify your pages are compliant. The errors should fall off Google’s webmaster tools amp display in a few days or so. That should be the cure if you had no errors recently and were shocked to all-of-the-sudden see massive errors.